Passengers and MPs, including Greater Manchester Mayor front runner Andy Burnham, have slammed bus service cuts across the region. A total of 20 services, many vital to commuters getting to work and patients travelling to hospital, are to be axed, reduced in frequency or have their routes curtailed . Run by Stagecoach, First and Arriva, the changes affect passengers in areas including Manchester, Rochdale, Salford, Bury, Oldham, Bolton, Wigan, Wythenshawe and Trafford. Hundreds of people have reacted to the news - with many saying that the services provide a link link to jobs and training around the region. And politicians are now demanding bus firms justify their decision. Speaking out, Mr Burnham, Labour’s Mayoral candidate, said: “It is simply wrong that bus services can be chopped and changed at the whim of the operator. “People will lose confidence in using the service if they’re not sure whether a bus will turn up or not. “Bus services throughout Greater Manchester are too often run for the profit of the operators and not for the benefit of the passengers. “In recent years we’ve seen fares going up and vital services cut, often at short notice. It’s no surprise that the number of people using buses has gone down. Blackley and Broughton MP Graham Stringer, whose constituency will see reductions to the 118 service from North Manchester General Hospital to the city centre via Moston, said the move was ‘yet more evidence that these bus companies are getting public money under false pretences’. 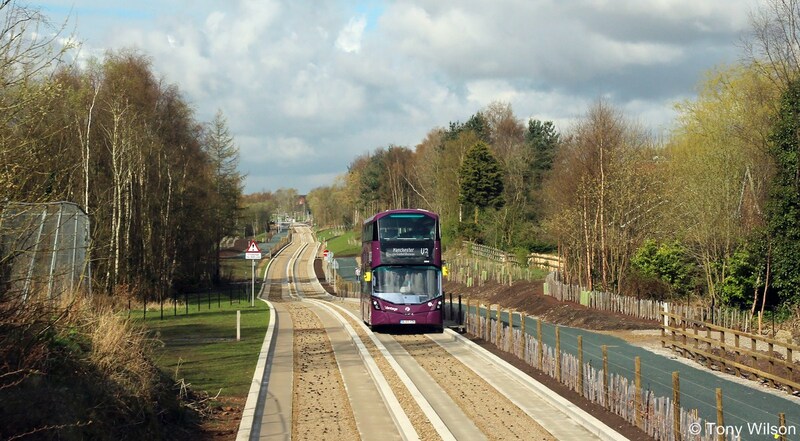 The two services to be axed are the V3, one of three buses which runs on the busway from Manchester to Atherton and the 109 from Wythenshawe Hospital to Manchester. Heywood and Middleton MP Liz McInnes said: “I am deeply concerned about the impact that these cuts to bus services may have on many local people. “The fact that these decisions have been made by private bus providers and not by Transport for Greater Manchester clearly demonstrate the need for properly accountable bus services in Greater Manchester. More than 600 people have already signed a petition on the change.org website protesting against the reduction of the 378 bus service from Stockport to Wilmslow. Haadia Mir, from Handforth, is among those who have signed the petition. Passengers have also been criticising the cuts on the M.E.N. Facebook page. All services affected are not subsidised by Transport for Greater Manchester. The changes have already been run past a Greater Manchester’s bus committee and will come into force from April 23. A Stagecoach spokesman said: “There will be selected service reductions in some localised areas to reflect changing travel patterns, however most customers will continue to be served by other services or public transport options. The vast majority of Stagecoach Manchester passengers will be unaffected by these changes. Phil Medlicott, managing director of First Manchester, said there would be ‘minor changes’ to services 95, 350, 468, 471, 511 and 524. He said improvements would also be made, with, for example, the cross-city service 18 to resume after the Oxford Road works, stopping at the Manchester Royal Infirmary. There is a full list of the latest affected services below. 468 Tottington/Bury/Jericho - Some Bury to Tottington journeys withdrawn in early morning and evening. 118 - NMGH/Moston/Manchester - Mon-Sat evening service reduced from every 20 to every 30 min, Sunday evening service doubling frequency to every half hour. 86 - Chorlton/BrooksBar/Manchester - extra journey added Mon-Fri at 4.55am. 19 - Altrincham/Sale/Wythenshawe/Manchester Airport - First journey at 4.02am from Sale Moor to World Freight withdrawn. A comment received from NMcB puts a rather different perspective on the above information. While strictly speaking it is true to say that Vantage Service has been axed, this statement is to say the least highly misleading! What is happening is that the hourly service V3 between Leigh, Tyldesley and MRI will be replaced by V1 between the same points every 15 minutes and V2 between Atherton Tyldesley and MRI every 15 minutes. The reported comment "So they spend a fortune on the guided busway and bus lanes on the East Lancs only to pull one of the new premium services. Crazy could not be further from the truth. Unfortunately this is what happens when press and politicians get hold of half a story and interpret it in a way which suits their own ends. I believe the term is "Fake News"
We agree and apologise for the fact that this posting was published without further investigation. We are quite aware of the mischievous and damaging activities of politicians and some branches of the media.